Chocolate cupcakes and milk chocolate frosting are both infused with malted milk powder. Make the Cupcakes: Preheat oven to 350 degrees F. Line two standard muffin pans with paper liners.2. In a large bowl, whisk together the flour, sugar, baking powder, salt and malted milk powder. Place the chocolate and butter in a small bowl and microwave in 30-second increments on 50% power, stirring in between each, until the mixture is melted and smooth. Stir in the oil until combined. Add the chocolate mixture to the bowl with the dry ingredients, along with 1 cup of the milk, and whisk until mostly combined (the mixture will be thick). In a measuring cup, whisk together the remaining ¾ cup milk, eggs and vanilla. Pour half of this mixture into the bowl and whisk until incorporated, then add the second half and mix again until everything is combined. Divide the batter evenly among the liners, filling each about ¾-full. Bake for 20-24 minutes, or until the cupcakes spring back when lightly pressed and a toothpick inserted in the center comes out clean. Remove the pan to a wire rack and let the cupcakes cool for 5 minutes, then remove to a wire rack to cool completely before frosting. Make the Frosting: Place the chopped chocolate in the bowl of a stand mixer; set aside. Whisk together the malted milk powder and heavy cream in a small saucepan. Place over medium heat and bring to a simmer, whisking constantly. Remove from the heat and pour over the chopped chocolate in the mixing bowl. Cover the bowl with plastic wrap and let stand for 5 minutes. Remove the plastic wrap and gently stir the chocolate mixture with a whisk or rubber spatula until completely smooth and no lumps remain. Cover the bowl again with plastic wrap and refrigerate for at least 2 hours, until thoroughly chilled. Using the whisk attachment of your stand mixer, begin beating the chocolate mixture on low speed and gradually add the pieces of butter, one piece at a time, scraping the sides of the bowl as needed. Once all of the butter has been incorporated, increase the mixer speed to medium-high and beat until the frosting is thick and smooth. If it's too thick to pipe, you can add more heavy cream, a teaspoon at a time, to thin out the consistency. 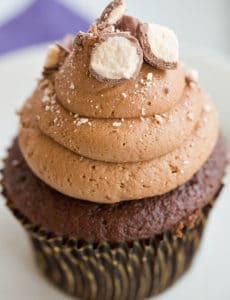 Using the decorating tip of your choice (I used an Ateco #808), pipe the frosting onto each cupcake and top with chopped malted milk balls, if desired. Store the cupcakes in an airtight container at room temperature for up to 4 days.